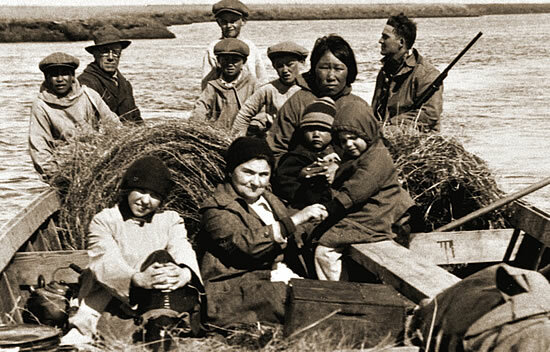 Theresa Moses recalled: "In fall, people travel in boats and pick coarse seashore grass. They look for good ones for sewing grass baskets. Those who don't gather are in need and don't have grass.". Wangkuta tukuutekaqaput gguq caranglluut. Wangkuta maa-i teguyaraput Yup'igni. Tukuutekluki. They say these grasses are our riches. We Yup'ik people constantly used them for something. They are our wealth. 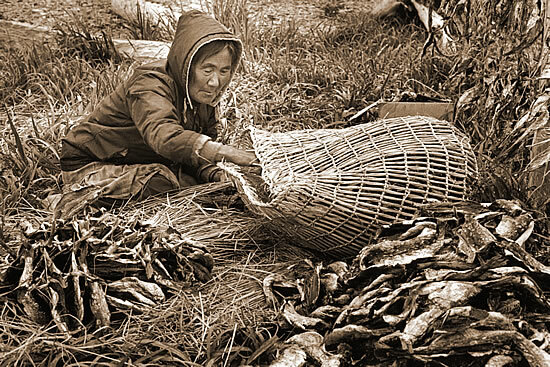 Clara Akagtak stores dried herring in an issrallugpak (large grass storage bag) she made quickly from nearby grasses, Umkumiut fish camp, 1976. Can'get - Grasses had different uses. Taperrnat - Coarse seashore grass, harvested after fall freeze-up and in the spring, was twined into mats and baskets. 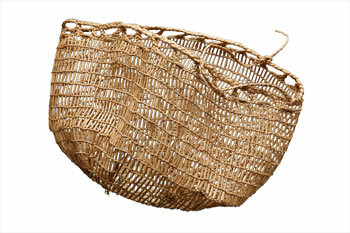 Kelugkaat - Coarse grass was picked in late summer and made into tomcod storage bags and grass socks. Iitaat - Tall cottongrass, gathered in abundance from the edges of tundra ponds, was ideal for lining boots and mittens. 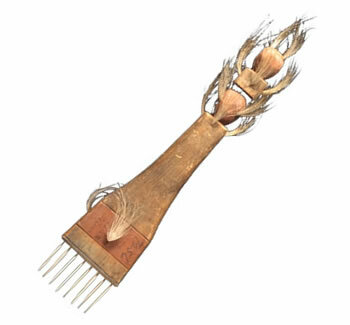 Comb from Sabotnisky for preparing grass, decorated with hair. Peter John said that they always combed coarse grass before braiding it. 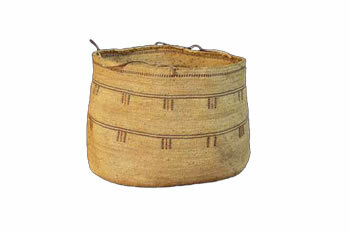 Pack basket made by Alice Pitka of Toksook Bay to be used as a backpack. Frank Andrew said, "They made them small so they wouldn't be hard to lift."